Much has been written about innovation and the creation of new business and technology ideas. Little has been written about how a person makes that creative leap to come up with something new an valuable, the process that leads to the “Aha” moment. Columbia Business School professor William Duggan has written about just this topic in his new book Strategic Intuition. I conducted an e-mail interview with Prof. Duggan to talk about the themes of his book, with a focus on the relevance of his ideas to entrepreneurs and startups. First, though, here’s a brief introduction to his book. Duggan is talking about not just any new idea but ones that are potentially game-changing, ones that seemingly come out of the blue and have a profound impact. Duggan starts his book off by differentiating strategic intuition from the expert intuition that Malcolm Gladwell detailed in his bestseller Blink. 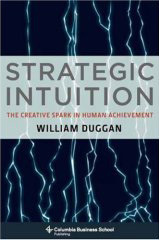 Duggan goes on to describe how strategic intuition is achieved and how it is necessary for developing creative leaps into unexplored territory. He does so by investigating how strategic ideas get created through an examination of such diverse topics a Napoleon’s wartime strategy, Thomas Kuhn’s theory of scientific breakthroughs, and Buddha’s enlightenment. Duggan then discusses how strategic intuition has been applied in some well known and not-so well known business and political situations. The following is the e-mail conversation that I (BE) had with Prof. Duggan (WD). BE: Clausewitz, Kuhn, and Buddha are not obviously connected to each other or to business strategy. What was the inspiration to make these connections when preparing your book Strategic Intuition? WD: I noticed in reading that all three explain that good ideas come to you in the same way: as flashes of insight. Previous elements come together in your mind in new combinations. They all talked about different subjects: Clausewitz on military strategy, Kuhn on scientific discovery, Buddha on personal enlightenment. So the content of the ideas is different in each field. But the method of the good ideas forming is amazingly similar in all three. BE: In war, chess, and other disciplines, strategy and tactics go hand-in-hand. What is the relationship between tactics and strategic intuition, and how do tactics relate to what you call expert intuition? WD: The quick retrieval of the right tactic in the right situation is the essence of expert intuition. An emergency room nurse is just walking by, glances at a child, and swings into action to save the child’s life. The nurse can act so fast because she has seen that ailment before in some form, and her training or experience told her the right tactic to use. Strategic intuition is different from this in three key ways. First, it applies to new situations. Second, it’s slow. Third, it brings together many tactics in a new combination. BE: So simply put, expert intuition enables tactical action, while strategic intuition enables strategic action. In your book, you state that “Expert intuition works for familiar situations…But strategic intuition works for the unfamiliar” (p.7). Your thesis here is that the application of intuition built from years of experience, such as that described in Gladwell’s book Blink, will not lead to innovations that can be provided by strategic intuition. People often try to apply their expert knowledge to new situations, thinking that insight from their own field of expertise will provide new and useful guidance to these new fields. Entrepreneurs often do this, and certainly venture capitalists rely on their own expert intuition when assessing new technologies and business plans. How can an entrepreneur tell when they are inappropriately applying their expert intuition and when their “flash” of insight is the result of a breakthrough from strategic intuition? WD: It’s entirely possible that some of what worked in field A will work in field B. But you improve your chances if you also draw from field C, D, E, F, G and so on. So you cannot set out blindly to apply field A to field B. But it does often happen that you’re just going about your business in field A and it strikes you how to apply it to field B or C or D. That’s good. For example, Henry Ford got the idea to turn a stationary assembly line into a moving assembly line from the overhead rail of a slaughterhouse. But he did not set out, as a planning exercise, to apply slaughterhouse ideas to carmaking. That would be crazy. So the moral is: keep your mind open to using an idea from any field in any other field. And notice that Ford was no expert on slaughterhouses. You can borrow many ideas without any direct expertise at all in that field – which is another big difference from expert intuition, where everything depends on lots of direct practice. BE: That makes me think of a lesson I learned from a successful serial-entrepreneur in Silicon Valley: that startups often innovate by taking technology that is mature in one field and introducing it to a field in which that technology currently doesn’t exist, doing so at the moment when the market is ready for that unique technology transplant. You highlight this concept when discussing Thomas Kuhn’s The Structure of Scientific Revolutions. You note that “the common idea of how a leap of progress happens is a leap of imagination. Kuhn gives us an alternative to imagination…a selective combination of elements from the past makes something new. The elements themselves are not new” (p.16). It seems that many inventors and entrepreneurs develop innovations in ways similar to what Kuhn describes. The challenge is being able to identify those cross-disciplinary connections and to see the breakthrough that can arise from combining those previously unlinked technologies. What are your thoughts on whether these approaches by startups and entrepreneurs make them more naturally inclined towards strategic intuition than established market-leading companies? WD: I don’t think people in startups and new companies have better ideas than people in big companies. I do think big companies make it harder to change direction, and most good ideas mark some kind of change of direction. So it’s easier for a good idea to come true in smaller companies. This is why I personally try to work mostly with big companies. They have elaborate methods for generating and implementing ideas that run completely counter to how flashes of insight really happen. When someone in a big company has a great idea, the company is already lumbering along a different path, and some top executive will have to admit that there is a better idea now and we need to spend a lot of money to change direction. You can see why that seldom happens. But it’s within the power of companies to make it happen. That’s where I try to help. BE: Are you familiar with IDEO’s approach of iterating customer observation and rapid prototyping as a way to gain insight into product use and to develop product innovations? Their approach seems to be a variant of Kuhn’s stages of scientific breakthrough. WD: There’s a wonderful book by Andrew Hargadon, How Breakthroughs Happen, that shows how IDEO draws existing elements from very different fields to make a new combination. That’s exactly strategic intuition, and I think that’s the heart of their success. Customer observation and rapid prototyping are good, but many companies do that. I think what Hargadon points out is the most important piece of the puzzle. BE: Do patents embody strategic intuition or expert intuition—or do these concepts of intuition not apply to patent development? WD: The patent system is in chaos because better information – chiefly the internet – lets everyone trace backwards all the elements that you combine for a new patent. So the people who did each element claim a piece of the new patent pie. I think inventions are almost always strategic intuition in action, not expert intuition. By definition it’s a new combination rather than a repeat of the same tactic in the same situation. BE: In the traditional scientific method, one develops a hypothesis and then proves or disproves that hypothesis through experimentation. Kuhn points out that scientific breakthroughs do not occur though the scientific method; rather, breakthrough ideas occur after the assimilation and analysis of information, then experiments prove the truth of the breakthrough idea, and finally hypotheses are developed to explain the results. How do these concepts relate to innovation in business? One might view the traditional scientific method as akin to the market-research approach to business strategy: define a product offering based on knowledge of current customer demands, prove those demands with market research, then release the new product. Clayton Christiansen might call this incremental innovation. Kuhn’s scientific breakthroughs could be viewed as disruptive or radical innovations, where ideas are not readily apparent from current customer and market trends. Startup companies can be particularly adept at the equivalent of Kuhn’s approach because they typically have the breakthrough idea, take it to market, and then understanding the market and customer needs after assessing the success of the product. WD: The traditional scientific method does not start with a hypothesis. That’s the experimental method, which is step 2 of the scientific method. Step 1 of the scientific method is the work you do before you come up with a hypothesis and the experiment to test it. And scientists know how you start that first step: look in the laboratories of other scientists. So whenever someone wins the Nobel Prize, ten other people come forward to say they did this and that piece of the work. As in the patent system, that’s true. So yes, starting with market research is a version of the experimental method, not the scientific method. Market research should come after you have your new idea, because otherwise you have no idea which market to research, and you can spend a fortune researching exactly the wrong market. BE: Thanks for the clarification. Speaking of right and wrong markets, one strategy for finding new markets is Blue Ocean Strategy (BOS), described by Kim and Mauborgne in their book of the same name. Where do the concepts of strategic intuition intercept with the strategy of developing a business in an uncontested marketplace? The BOS concept seems at odds with the advice from Clausewitz, in that BOS advises not to compete directly in a fight for market share but to move to a battlefield where the enemy doesn’t even exist. WD: BOS makes the correct observation, after the fact, that the best business ideas create new markets rather than compete within existing markets. But BOS does not tell us how to get an idea that creates a new market. In fact, it leads you down exactly the wrong path, by telling you first to identify a new market with nobody in it. That’s actually a recipe for losing a lot of money, because by far the overwhelming majority of markets with nobody in it have nobody in it for a very good reason: there’s no money to be made there. Let’s take Microsoft: after the fact, we can see that they were the world’s first company to specialize in operating software, when there was nobody else in the market. But did the idea for Microsoft come from first identifying that empty market? Of course not. Bill Gates and Paul Allen had no idea that operating software would be a big business until after their first success – BASIC for the Altair – which they put together from existing elements that were within the grasp of millions of computer geeks at the time. Their flash of insight brought those previous elements together. Then they realized they were first in a new market. First the flash. Then the blue ocean. Not the other way round. BE: “First the flash…” This is one of the main points of your book: that the flash is an acknowledged part of innovation, yet no one before has explained fully what is required to spark that flash. That’s where strategic intuition comes into play. You state, “What triggers active problem solving is the ability to recognize when a goal is achievable…There must be an experiential ability to judge the solvability of problems prior to working on them” (p.47). This speaks to the need for experienced management teams on startup companies proposing breakthrough technology, and experienced teams are something that venture capitalists look for in companies that they are considering for investment. It also speaks to the need for researchers to immerse themselves in their field of investigation if they want to develop their own breakthrough ideas. Yet it is often thought that someone with no experience in a specific industry might bring fresh eyes to problems and not be restricted in their thinking by common wisdom and past assumptions, i.e., they do not have expert intuition for that field. Is this thinking naïve or wishful thinking? WD: That quote is from Gary Klein, the world’s leading expert on expert intuition. But as to your question: I think the confusion comes from the meaning of “experience.” Napoleon won his first battle against terrific odds without any previous combat experience. Yet he had studied all the major battles of history, and so had all the experience of previous generals to draw on. Expert intuition requires direct experience. Strategic intuition requires knowledge, which you can get from reading or talking to people. So yes, someone with no experience in an industry can bring fresh eyes to it. But it’s unlikely that someone with no knowledge of an industry can do the same. So someone from the slaughterhouse industry could bring a fresh idea to Henry Ford, who was already in the car business. But someone has to know the car business too, to understand why the moving rail is such a good idea. So I guess that argues for insider/outsider teams, where one person knows the industry and someone else brings fresh eyes. The problem there is that their fresh eyes might not be the ones you need. So imagine that Henry Ford brought in someone from the shipping industry, not the slaughterhouse industry. There’s no way to predict which fresh eyes you need. That’s why my favorite formula is someone with deep industry knowledge who consciously opens their mind to drawing from other fields – like Henry Ford himself. BE: I agree completely with what you say. I’ve found that some of the most innovative people I know are those who have a wide variety of intellectual interests and look for inspiration from outside of their field of expertise. How should these people, or any entrepreneur attempting to develop new technology, think about Clauswitz’s decisive point when considering their own business strategy? WD: The key to the “decisive point” is the contrast with the “objective point.” Like everyone else, an entrepreneur must set goals. But never think they’re set in stone. An example is Puma, which Jochen Zeitz took over when it was a small, failing shoe company. He made a tough four-year plan to outsource production and streamline operations. A year into it, the Beastie Boys wore one of his styles at a concert – the Clyde – and the shoes sold out overnight. It was a decisive point: he realized he had a fashion sports apparel company, and threw out his objectives. The decisive point is where you win. The objective point is just your current guess on where your latest idea will take you. BE: Right, and Zeitz’s strategic intuition enabled him to identify that decisive point and take action. In a completely different field from military strategy, photographer Henri Cartier-Bresson talked about the decisive moment defining creative success in photography: “There is a creative fraction of a second when you are taking a picture. Your eye must see a composition or an expression that life itself offers you, and you must know with intuition when to click the camera.” The decisive point and the decisive moment seem to be similar concepts, both requiring experience from which intuition is drawn, the presence of mind to be looking for the breakthrough, the actual epiphany, and finally the execution. WD: My guess is that Cartier-Bresson is talking about expert intuition in that subset of professional fields where there is a lot of waiting and then quick action. Hitting a baseball is similar. Martial arts have a whole philosophy and discipline for this. It shades into strategic intuition if the situation is new enough – perhaps if Cartier-Bresson takes on a new subject, a hitter faces a new pitcher, or a samurai confronts a new enemy. Napoleon spoke in terms similar to Cartier-Bresson’s about the moment when you make your decisive move in a battle – that is, when the decisive point appears. BE: Miss that moment, and you risk failure. One builds up strategic intuition, in a way, to be prepared to take advantage of that decisive moment when it occurs. Do you believe that everyone has the ability to have strategic intuition—to innovate and create that flash of insight that combines elements from the past into something new? How can a company identify individuals who are better at this than others? What steps can be taken to successfully promote the development and application of strategic intuition? WD: My own view is that strategic intuition is an ordinary function of the human mind. Can some people do it better than others? I have no idea. We have no way to measure. Ray Kroc was 52 years old, struggling to sell milkshake machines, when the idea for McDonalds struck him in a classic flash of insight – he called it an “Idaho potato” hitting him on the head. The day before you would think he had no strategic intuition at all. The day after, you’d think he had a lot. Did his capacity for strategic intuition change overnight? I doubt it. I do have a survey that shows how close people think to the basic ideas of strategic intuition, so companies could use that, but how you answer a survey and what you do in action are two very different things. So I’m not sure how to identify people with more strategic intuition. But I think I know how to promote the development and application of strategic intuition: that’s what my whole book is about. First, learn what strategic intuition is. (That’s in the book.) Second, apply tools that use it. (Those are in the book too.) Third, stop using other tools that inhibit strategic intuition. This third step is the hardest, and that’s why big companies suppress strategic intuition so much. BE: You quote from Napoleon’s memoirs: “I bent my policies to accord with the unforeseen shape of events” (p.76). One common characteristic among many successful startups in Silicon Valley is their flexibility towards their business strategy. Startups often reach unanticipated roadblocks and their ability to readjust their business plan with decisiveness—to find new applications or customers for their technology and abandon their original business plans–can determine whether they will succeed or fail. You note that, “He [Napoleon] passed up more battles than he fought, looking for only those he could win” (p.172). This speaks to the need for startups to narrow their focus on what they are trying to achieve. Venture capitalists shudder when they see a business plan with multiple markets being addressed because this indicates a lack of focus for the startups inherent limited resources. Are restricted focus and strategic constraints necessary for the successful application of strategic intuition? WD: I think this is actually easier than it looks. It’s very rare for a business plan to include the most important thing: what previous elements combined in the entrepreneur’s mind to make up the new idea. Since that’s not in the business plan, the VC must ask the entrepreneur in person. If there’s a good answer, the VC will then have as good an idea as the entrepreneur of what markets the idea might or might not fly in, at least to start. Then as the entrepreneur wants to change strategy, the VC will be up to speed to understand why. BE: This being a blog about innovation, I have to ask the obvious question: what is the relationship between strategic intuition and innovation? WD: Strategic intuition is how successful innovation happens. I’ve studied countless cases, and when there was enough information to identify the source of the actual idea for innovation, it was always strategic intuition. It’s really a simple idea: for something complex to work, each piece that makes it up has to have worked before, in some way, sometime, somewhere in the world. Innovators don’t dream – they combine. How else could it possibly work? BE: Our discussion has only scratched the surface of the material and insight provided in your book Strategic Intuition. I recommend to those readers of this blog who have found these topics interesting to seek out the more in-depth discussions in your book. Thank you, Bill, for what has been for me a fascinating discussion. Best wishes, and good luck with your book.